At the Bonhams 2015 Amelia Island classic car auction eight cars may achieve a million dollars with pre-Second World War cars particularly interesting. The headline lot is a 1930 Cord Model L-29 Town Car with a Hollywood history while Marlene Dietrich’s 1930 Rolls Royce may also achieve a million dollar. The oldest car expecting to sell for a million dollar is a 1908 American Underslung Roadster while the newest is a 1992 Ferrari F40. A 1934 Mercedes Benz 500K and a 1932 Stutz Super Bearcat Convertible is also expecting to achieve over a million. A late 1962 Mercedes Benz 300 SL is also on offer. Bonhams will have its inaugural Amelia Island classic car auction on March 12, 2015 at the Fernandina Beach Golf Club. Bonhams thus joins Gooding and RM Auctions at the annual mid-March Amelia Island classic car sales in Florida. The inaugural Bonhams Amelia Island classic car auction will have a wide range of vehicles on offer but several older pre-Second World War cars are attracting much attention with several expecting to sell for more than a million dollar each. A 1930 Cord Model L-29 Town Car (Estimate on Request) will headline the Bonhams Amelia Island sale. This car is one of only four L-29s ever built and the only one of the short-wheelbase versions to have survived. The Cord originally probably belonged to 1930s Hollywood film star Delores Del Rio and has been in the collection of Jay Hyde for 55 years. The car is in a very original and well-preserved unrestored condition. The green 1930 Rolls Royce Phantom I Transformal Phaeton (estimate $700,000-$1,000,000) has a similar Hollywood connection – it originally belonged to Marlene Dietrich, who received it as a gift from Paramount (in addition to a bouquet of flowers). The Rolls Royce was used in Morocco, a movie for which Dietrich received an Oscar nomination. 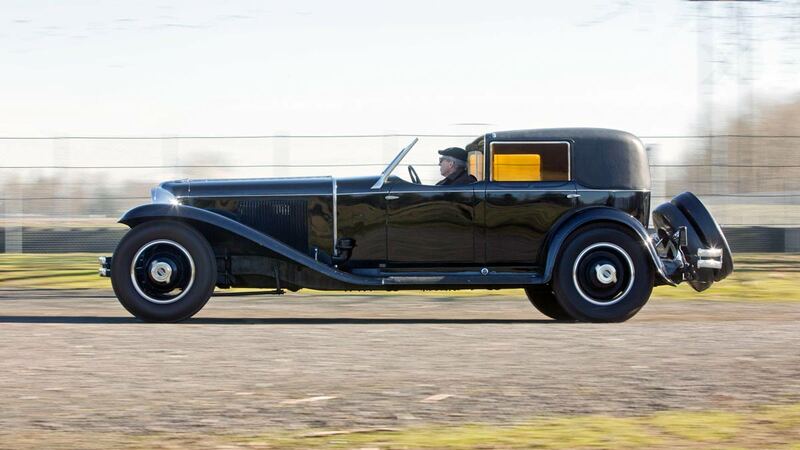 Since 2007, the Rolls Royce has received restoration work in excess of $500,000 and is thus in supreme concourse condition. It has received many show honors, including Best in Class at 2013 Amelia Island Concourse. The car last sold at the 2012 Bonhams Scottsdale classic car auction for $524,000. The 1908 American Underslung 50 HP Roadster (estimate $1.1 – $1.2 million) is the oldest car on offer at the Bonhams 2015 Amelia Island sale with an estimate exceeding a million dollars. It is considered by many to have been the first American sports car. The 1932 Stutz DV-32 Super Bearcat Convertible (estimate $850,000 – $1,200,000) is another classic American sports car. This sample is highly original and still has its original Weyman fabric skin. The 1934 Mercedes Benz 500 K Four Passenger Tourer (estimate $1.25 – $1.5 million) is one of only 342 Mercedes Benz 500K cars ever produced. Furthermore, it is one of only eight right-hand drive chassis delivered to the UK for custom coachwork and probably the only example with bodywork by Mayfair. The 1962 Mercedes Benz 300 SL Roadster (estimate $1.6 – $1.8 million) is expecting to achieve at the higher end of the successful price range achieved at recent auctions. The post $1.5 million estimate is due largely to the car being a late matching-numbers model with disc brakes and an aluminum alloy engine block. The 1992 Ferrari F40 (estimate $1.2 – $1.4 million) on offer was the last of 213 US-specification F40s ever built. It has covered less than 10,000 miles since new.